Comb Ridge is a huge, jagged monocline, curving for 80 miles across the center of the Colorado Plateau, from Kayenta in north Arizona to the foothills of the Abajo Mountains near Blanding. The most prominent section lies towards the north, where the ridge is crossed by highways 95 and 163; for about 30 miles the faultline reaches heights of 700 feet above the surroundings, and is characterized by gently sloping ground to the east, formed by the top of a layer of white Navajo sandstone inclined at 20°, and by an unbroken line of sheer cliffs to the west, where several of the underlying strata are exposed, most visibly the red Wingate sandstone. 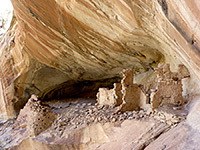 The more accessible east side of the reef is split by many short box canyons, often containing springs, seeps or pour-over pools, and these sheltered ravines provided ideal dwelling places for the ancient Anasazi, who built settlements in alcoves and on benches, and decorated the canyon walls with pictographs and petroglyphs. Both sides of Comb Ridge are paralleled by good quality dirt tracks, linking the two main roads, and also by seasonal streams: Comb Wash to the west and Butler Wash to the east. Although this latter is a very shallow drainage for most of its length, flowing across open desert, it forms a vertical-walled canyon towards the south, up to 300 feet deep, containing a permanent stream, which originates from a spring a few miles north of US 163 . Here are found several more ruins, and one of the best group of petroglyphs in the Southwest (the Wolfman Panel). Although all this area is generally little known and not much visited, the BLM maintain several trailheads near the most important ruins, and various side tracks lead to other places, yet doubtless there are sites still to be discovered, hidden in the approximately 50 significant canyons along this part of the ridge. As all the surroundings are public land, free camping is permitted anywhere in the vicinity, and the region is quite scenic and geologically interesting, so worth exploring even for those not especially interested in the Anasazi. Six of the many locations are described below, from south to north; three along the main roads, and three along the track beside Butler Wash.
23 views of Comb Ridge and Butler Wash; gallery, slideshow. The easiest reached ancient site in the Comb Ridge area is at Sand Island, a BLM recreational facility beside the San Juan River, consisting of a campground and boat launch point. 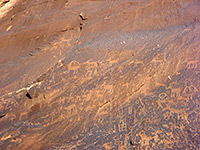 The river flows through a wide, shallow canyon, and one section of the red sandstone cliffs bordering the campground is covered by a petroglyph panel extending for about 50 feet, containing hundreds of effigies, the majority rather small and faded, yet the overall scene is still impressive. 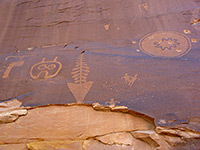 The panel is fenced off but easily viewable from below; the designs, some quite high above ground level, include big horn sheep, deer, geometric shapes and people. 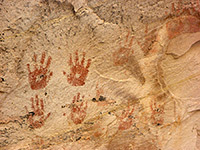 A fee is due if camping and boating though not if just viewing the rock art. The entrance to the recreation area is along US 163, 2.5 miles west of Bluff. US 163 crosses the canyon of lower Butler Wash just east of Comb Ridge. A pullout near the road bridge provides a place to park, from where a short walk southwards along the west rim and down the sloping sides reveals a small ruin in an alcove - not very spectacular but quick to reach. The dwelling is built a little way above the rather inaccessible creek, which flows lower down through an alluvial ravine, but walking is straightforward on the grassy bench above. 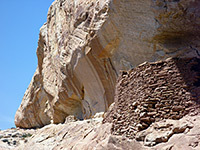 Another similar ruin is found about a mile downstream, just beyond the second west-side tributary, while there are other structures, and petroglyphs, further south around the confluence with the San Juan River. The graded Butler Wash Road meets US 163 on the east side of Comb Ridge; past an unlocked gate, the road heads northwards over open, sandy ground, soon crossing a bumpy patch of slickrock but then staying smooth and in good condition all the way to UT 95, with just a few steeper sections in and out of dry washes. All along are short tracks to the west, leading a little way towards Comb Ridge; these are short because Butler Wash runs close by and vehicles can't cross the streamway, and also because the far side is a wilderness area. Most ruins are near the middle third of the road, between 7 and 12 miles, but one of the most famous sites is much closer, just one mile from US 163; this is the Wolfman Panel, a particularly large, crisp and artistic group of etchings, on the cliffs bordering the east side of Butler Wash. Parking is either along Butler Wash Road or 450 feet away down a side track. A sign marks the wilderness boundary, though tire marks are still visible along the continuation of the track as it descends slightly to the edge of the wash, here still flowing through a rock-walled canyon, the waters originating from a spring a mile north, unlike the upper portion of the wash which is dry for most of the year, running between banks of earth. 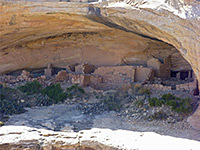 Cliff dwellings are visible from the rim, on the far side, at the foot of the canyon walls, and could be entered from the bench below; as with the lower canyon, the stream is enclosed by alluvium walls ten to 20 feet high. The path to the petroglyphs is easy to locate, angling down the cliffs to the base of the panel, whose designs include masks, shields, people and the wolfman himself. Another minor ruin is located on the far side of the canyon just downstream, reachable, with a little effort, by descending into the alluvium ravine, crossing the creek on a beaver dam, climbing up the far side and traversing south to a viewpoint. The site is small and not easy to enter owing to cliffs below. One relatively well known site is reached 7.2 miles along the road - known as Monarch Cave Ruins or Hidden Pool Ruins. These sit at the head of a box canyon, in a large alcove surrounded by colorfully-streaked cliffs, above a permanent pour-over pool. The site has one main ruin, several lesser structures and many petroglyphs, colored yellow, green and white in addition to the usual red. There are two possible start points for the 0.8 mile hike, 0.1 miles apart, both at the end of very short vehicle tracks. The routes cross the bushy, tree-lined course of Butler Wash, over the open area beyond and into the shallow canyon, also filled with much undergrowth. The drainage ends beneath a big dryfall; the ruins are about half way up the side, reachable by walking around either from the north or the south. The majority of the petroglyphs are found on the north side, near a fenced off area marking the unexcavated site of the settlement's refuse area. 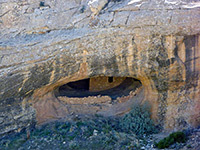 The main ruin is right at the far end of the canyon, quite degraded but still with such original relics as structural timbers, roofing materials, metates and pottery fragments. Amongst the more modern graffiti on the cliffs nearby is a reference to Monarch Cave made by an explorer in the late 1800s. Another significant site is a few miles further north (9.6 miles from US 163), where two side tracks converge and drop over a low escarpment to a bushy parking area next to Butler Wash. A trail continues northwestwards, over a field to a group of cottonwood trees beside the exit drainage of one of the many small canyons draining the east slopes of Comb Ridge. The hiker-made path winds over undulating ground a little way further before descending into the canyon, soon veering into the north fork of the drainage, round a bend to a site known as Split Level Ruins. The ravine at this point is quite overgrown, containing big shady trees and residual pools. The ruin is on two levels - the lower part is built in front of a tapering, horizontal cleft that extends backwards many feet, while above are more wall remnants, better preserved, in an elevated alcove. It is fairly easy to climb to this level, up some cliffs near a faded row of moqui steps, but rather harder to traverse the narrow ledge leading to the ruin. 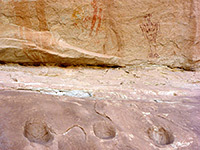 There are several petroglyphs in this area, including handprints at the lower level, above a fireplace, and three unusual green and white circular shapes higher up. 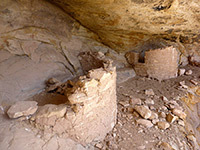 The only developed ancient site near Comb Ridge is the Butler Wash Ruins, along UT 95; a little paved road ends at a parking area, start point for a half mile trail across a mix of sand dunes and white slickrock bearing bushes, cacti and yucca, to the rim of a box canyon, opposite a 150 foot pour off. 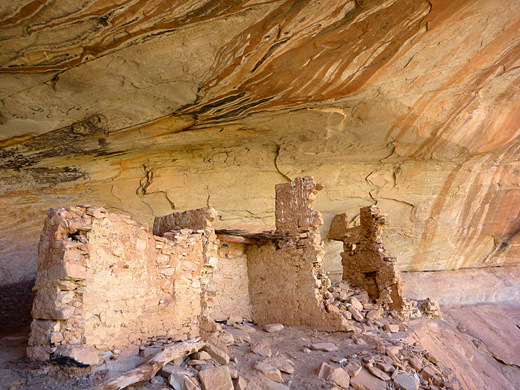 A huge sandy alcove at floor level contains no ruins; instead the structure is built in a less accessible alcove above, and seems well preserved, complete with doorways, stairs and kivas. A single, neat dwelling is found in a deeper pothole adjacent, and there is a smaller ruin just downstream. None are easy to enter, hence they have remained relatively undisturbed.